This emerald Claddagh ring has been hallmarked 14K gold by the Irish Assay Office at Dublin Castle in Ireland. This 14K yellow gold Claddagh ring features an emerald heart with three 1.5mm stones along with 28 individually set diamonds in the crown and cuffs along with surrounding the heart for a total caret weight of 0.15ct. This emerald Claddagh ring measures 3/8" tall, from the bottom of the heart to the top of the crown and it is enhanced with white gold accenting. This Claddagh ring is made by Solvar Jewelry in Dublin, Ireland and it is gift boxed with a Galway Folklore card that explains how to correctly wear the Irish ring along with a Claddagh legend card, complements of The Irish Gift House. 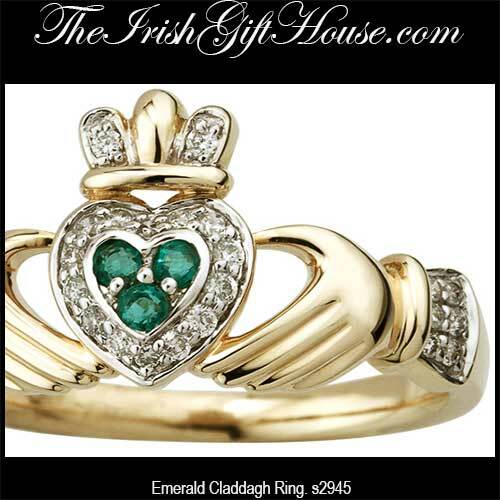 This emerald Claddagh ring is available in sizes 5 through 9, including half sizes. 14K gold emerald Claddagh ring features Celtic knots along with diamond accenting. White gold emerald Claddagh ring also features diamond accents. 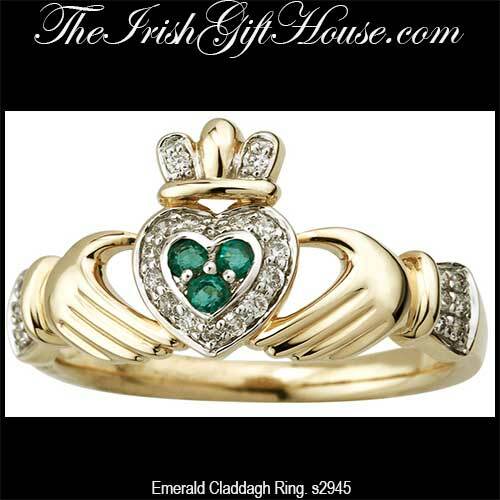 Gold Claddagh ring features a genuine emerald heart along with diamond accents.